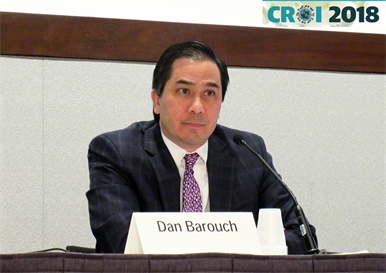 Dan Barouch presenting at CROI 2018. Photo by Liz Highleyman. Treatment with a broadly neutralising antibody plus an immune-stimulating drug led to long-term viral remission after interrupting antiretroviral therapy in a monkey study, according to data presented at the 25th Conference on Retroviruses and Opportunistic Infections (CROI 2018) this week in Boston. Monkeys that received both the antibody, known as PGT121, and the TLR7 agonist GS-9620 maintained an undetectable viral load without antiretrovirals for a median of 112 days, according to Dr Dan Barouch of Beth Israel Deaconess Medical Center in Boston. Five of eleven treated animals still remained virally suppressed at six months. Researchers working on a functional cure for HIV – meaning sustained viral remission without antiretroviral therapy (ART) – have studied various 'kick and kill' strategies aimed at reactivating the reservoir of latent virus and helping the immune system attack it. PGT121 is a broadly neutralising antibody that targets the V3 glycan site on the outer envelope of HIV and SIV, a related virus that infects monkeys. GS-9620 is a TLR7 agonist that stimulates toll-like receptors on immune cells, part of the innate immune system that promotes recognition and response to viruses. Activating TLR7 enhances the activity of T-cells, natural killer cells and other immune cells. Both agents are being developed by Gilead Sciences. At CROI 2016, researchers reported that GS-9620 alone led to T-cell activation in macaque monkeys infected with SIV. These animals had a more pronounced decline in viral DNA levels in their T-cells, lymph nodes and gut tissue. One monkey maintained an undetectable viral load for about three months after stopping ART, but eventually they all experienced viral rebound. Hoping to improve on this response, investigators tested GS-9620 in combination with a neutralising antibody. This study included 44 rhesus macaques infected with a human-simian hybrid virus known as SHIV. On day 7, during acute infection, they started ART consisting of tenofovir, emtricitabine and dolutegravir. After two years of continuous suppressive ART, they received infusions of PGT121 (10 mg/kg every two weeks for five doses), oral GS-9620 (0.15 mg/kg every two weeks for 10 doses), both PGT121 and GS-9620, or 'sham' (placebo) treatment. ART was discontinued four months after the last doses of PGT121 and GS-9620. lymph nodes and gut. ART was discontinued after antibodies were no longer present. After stopping ART, all eleven monkeys in the sham treatment group experienced rapid viral rebound in a median of 21 days. Nine of the 11 animals treated with PFT121 alone, and 10 of the 11 treated with GS-9620 alone, also soon experienced viral rebound. Six of the eleven monkeys treated with PGT121 plus GS-9620 experienced viral rebound, but this took substantially longer – a median of 112 days. Five monkeys in this group (45%) continued to maintain undetectable viral load for at least 168 days after stopping ART, Barouch reported. Even after rebounding, monkeys that received the combination treatment had lower viral load setpoints and lower viral DNA levels in their lymph nodes, suggesting a decrease in the viral reservoir and some level of immune control over the virus. "PGT121 combined with GS-9620 during ART suppression substantially delayed and controlled viral rebound following ART discontinuation in SHIV-infected rhesus monkeys that initiated ART during acute infection," the researchers concluded. "These data suggest that [broadly neutralising antibody] administration together with innate immune stimulation during ART suppression may effectively target the viral reservoir." "There is no cure for HIV, and any such intervention is a long way off, but this early stage preclinical data suggest that long term viral remission might in fact be possible," Barouch told reporters at a CROI press briefing. Experts are cautious about the prospects for a functional cure after various apparently promising interventions over the past several years have turned out to have only a temporary effect. Dr John Mellors of the University of Pittsburgh School of Medicine, who moderated the briefing, noted that this is the "first evidence of induced immune control in macaques—but in humans we haven't hit that milestone yet." Barouch added that even if this approach prevents viral rebound for several months, that doesn't preclude the possibility that virus is still present and could reactivate months or even years later. Even the most sensitive tests available today cannot detect all latent virus, he said. The PTG121 plus GS-9620 combination is now being studied in human clinical trials, according to a press release from the US National Institute of Allergy and Infectious Diseases. A Gilead press release indicated that GS-9620 is now in a phase 1b dose-escalation study in people with suppressed viral load on ART, and a derivative of PGT121 known as GS-9722 is starting phase 1 testing. Borducchi E et al (Barouch D presenting). PGT121 combined with GS-9620 delays viral rebound in SHIV-infected rhesus monkeys. 25th Conference on Retroviruses and Opportunistic Infections (CROI 2018), Boston, abstract 73LB, 2018.